I study conflicts between polar bears and people for a living and I like thriller novels, so I had to see what this book was all about. “Eaten” is a great read with a thought-provoking scientific premise, and it gave me the freaking chills. Here’s why. Since we have failed to put the brakes on climate change so far the Arctic is warming and changing at an accelerating rate. In field-level polar bear management circles, people don’t talk about the kind of scenario that forms the premise of this novel as an “if”. Instead, they describe it as a “when” and they are not looking forward to it. The plot revolves around the carnage that results as a swarm of polar bears, denied access to their regular food source of young harp seals off Labrador in springtime, hit shore in northern Newfoundland and discovers that our species is a suitable alternative. Yes, Newfoundland. This context to the story is what makes Crockford’s story really interesting. 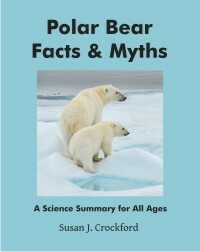 It would be a mistake to dismiss this book simply as climate change denial because it explores an unconventional scenario about climate/sea ice/polar bear relationships. Personally, I would place my bets on any events resembling this story happening first in Hudson Bay or Svalbard as a result of abrupt sea ice loss rather than where and how it unfolds in “Eaten”. However, by setting the book in an unexpected but still-plausible locale and giving the conventional projections of less-ice-means-starving-bears a twist, she creates a context that frees up her narrative in ways that make it thought-provoking and surprisingly engaging. I hope there’s a sequel, since there is a lot of scope to do interesting things with the main characters. But even given the environmental context here, would polar bears stalk humans en masse, as they do in this book? It would take one heck of a perfect storm, but given a sufficient absence of luck future events could start to resemble this story. Whether real events would rack up the same body count is far less likely, I think, but after all this is a work of fiction. 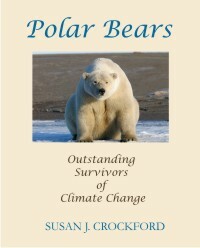 Susan Crockford has not only written a fun novel that gets readers thinking, she has probably done polar bear conservation a real service. Because of how politicized polar bears have become as symbols of climate change, fiction is the only arena where one can really present this kind of scenario right now. Our collective ability to work together in the polar bear conservation world has become sorely strained, and is probably not sufficient to muster an effective large-scale response to the sort of worst-case scenario that many envision. When that happens, all we may have as a guide to reach for is this book. 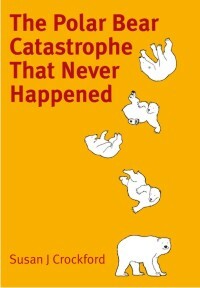 Doug thinks mass polar bear attacks might unfold in a different time and place, under different circumstances (see a list of his polar bear publications here), but does not dispute that such events would be impossible or even unlikely. The point is that any catastrophic event that threatens the ability of polar bears to feed sufficiently in the spring could turn them into human killers on a grand scale. Since I meant the novel to be thought-provoking as well as terrifying, I’m very pleased to find it had the intended effect on my colleague. I’m also impressed that he was open-minded enough to see the scientific value in thinking outside the box on these issues within a fictional context. Judge for yourself – read the book, if you haven’t already. Coming soon – a month long ebook sale (15 June – 15 July) for all electronic formats! Download EATEN for your summer reading or to save for a long winter weekend, for just $0.99. This entry was posted in Book review, Polar bear attacks and tagged book review, Doug Clark, Eaten, Ian Stirling, science-based fiction, sea ice, threat, thriller. Bookmark the permalink.